We had two of our closest friends over for dinner this weekend who were happy to be food blog guinea pigs and gave me full license to freely experiment. 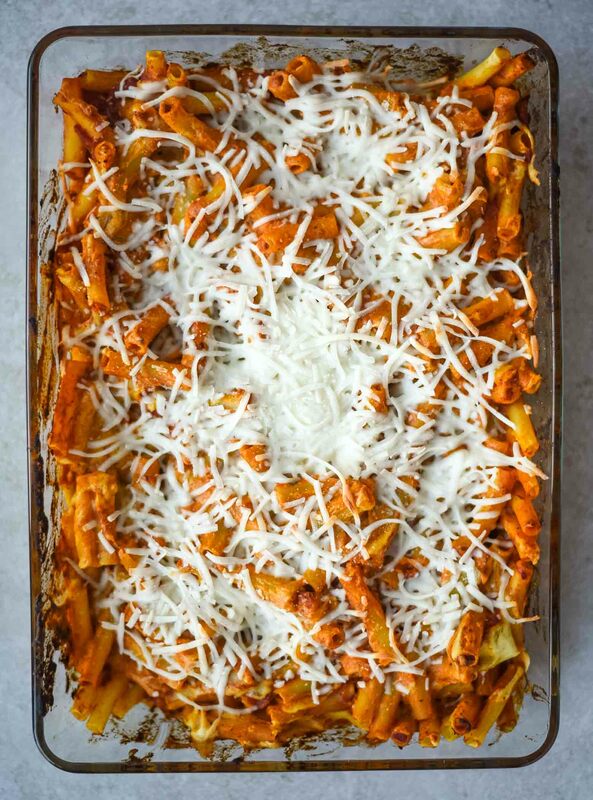 Because they’re good friends, I knew they would be brutally honest and was completely thrilled to see this easy vegan baked ziti recipe sending them back to the kitchen for seconds. While we were sitting in our backyard eating together, I zoned out a bit and started thinking about the value of family and the concept of chosen family. My wife, Shae, used to date one of our dinner guests. While not all relationship splits end amicably, Shae’s former partner and her fiancée have become really important fixtures in our lives. We travel and camp, figure out how to negotiate career situations, discuss deep-seated family stuff, work extremely well in puzzle rooms, and on occasion, drink a few too many IPAs together. While they’re not biological family, they are chosen family. As a queer person and cancer survivor living thousands of miles away from my biological family, chosen family is my support system. The concept of chosen family in the queer community is really important because not all families accept their LGBTQ members. Sometimes, people have to find a new family who accepts them as they are. I’m fortunate to have a biological family who loves me and accepts me and I’m also fortunate to have an incredibly strong and supportive community around me here in Seattle. To those of you reading, thank you. You mean the world to me. An important part of family, whether biological or chosen, is food. 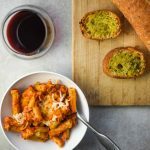 This vegan baked ziti reminds me of family – it’s comforting and hearty. As a bonus, it is really easy to make too. Cook your pasta, make your cashew sauce, mix in the marinara sauce, top with some vegan cheese, and bake. 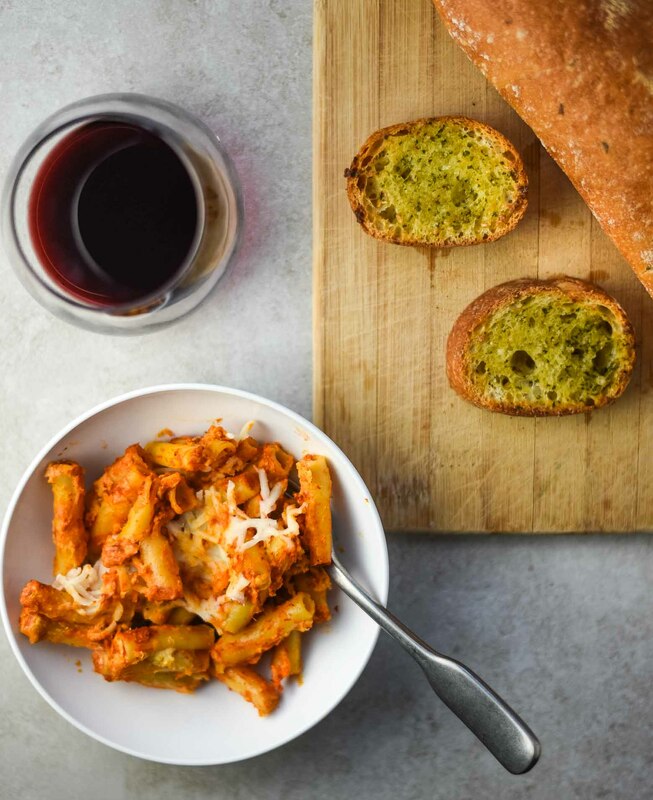 Pair it with vegan garlic bread and a glass of red wine for weeknight dinner nirvana. 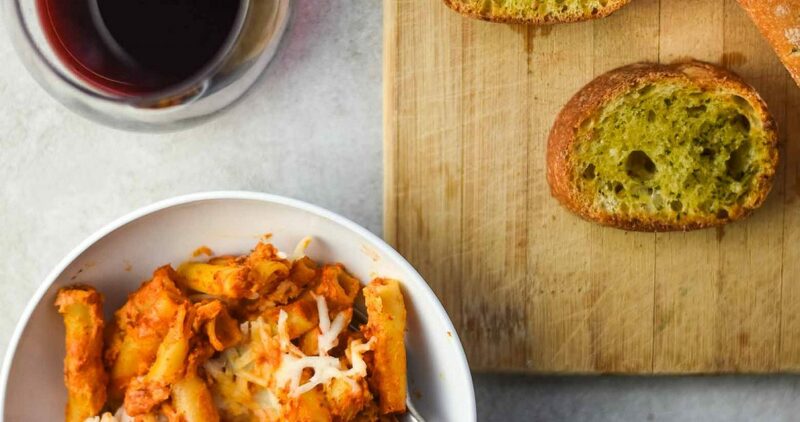 If you make this vegan baked ziti and drink some wine, let us know how it goes! Leave a comment, rate it, and don’t forget to tag a photo #plantandvine on Instagram. Barbera: Italian red with sour cherry, blackberry, and dried herb flavors that is a real champ with tomato-based sauces. High acidity and low tannins, so your mouth feels refreshed with every sip. It simultaneously straddles the line of rich and light. GSM Blend: GSM means Grenache – Syrah – Mourvèdre, a blended wine with raspberry, blackberry, dried herbs, and baking spices. The beauty of GSMs is that they tone down and complement the nuances of the individual varietals so you’re left with tasty smoothness. Montepulciano: the second most planted red grape in Italy, for good reason. Plum, oregano, sour cherry, and boysenberry with the right amount of juicy acidity. Hearty and comforting vegan baked ziti. Great weeknight meal. To prepare cashew cheese sauce, add the soaked and drained cashews, water, lemon juice, nutritional yeast, garlic cloves, onion powder, and salt to blender. Blend until smooth. Add the cooked noodles to casserole dish. To prepare the marinara sauce, mix marinara sauce with smoked paprika and red pepper flakes (optional). Pour the marinara sauce on top of noodles and stir to combine. Spoon the cashew cheese on top of saucy noodles and stir gently, leaving pockets of cheese intact. Bake, uncovered, for 10 minutes. After 10 minutes, remove from oven, and sprinkle vegan mozzarella cheese on top. Return to oven to bake for another 15 minutes. Let cool for 5-10 minutes before serving. Store in covered container in refrigerator. Good for up to 4 days. *Recipe is a guide. Adapt ingredients and measurements as desired. Baking times may vary depending on oven settings. 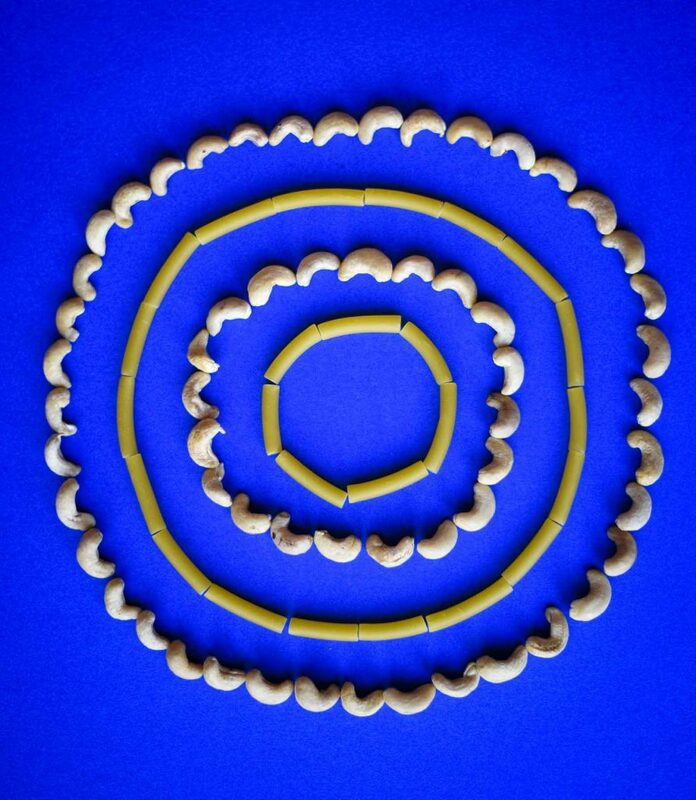 **To prepare cashews, boil water and pour over cashews. Let them soak in hot water for about 10 minutes before blending.